"Michael Turner wanted to add his own small tribute to those young men who put their lives on the line, leaving their bases night after night to set out over occupied Europe, not knowing what fate held in store for them. 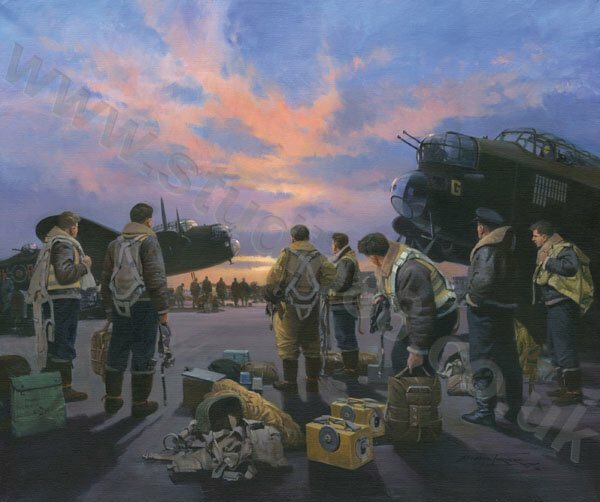 It seemed appropriate to concentrate on a scene featuring one typical bomber crew preparing to board their Lancaster, but pausing for a moment's thought to view a sunset sky. The title 'At the Going Down of the Sun', the first line of the touching remembrance dedication, seemed to sum up the emotions of the moment, leaving the viewers to make up their own minds whether these brave airmen returned or not. This painting is also available reproduced on good quality canvas, individually printed - just like the original oil painting - and then varnished for protection. Note that unlike paper prints, canvas prints have no white border - this is the overall size of the canvas on its wooden stretcher bars and the image extends to the edge. Canvas prints are individually hand signed by the artist on the reverse.